This elegant two story Monterey Colonial home is a landmark of the Upper Alta Canyada neighborhood. Beyond its grand exterior, the home is the perfect combination of elegance and comfort. A gracious entry leads to the lovely staircase and opens into the formal living room with welcoming fireplace and French doors to the scenic backyard. 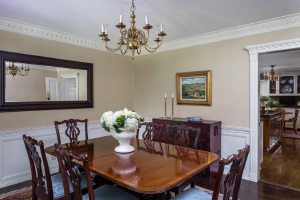 Across the entry is the formal dining room with wainscoting and sitting bench to enjoy the views of the front garden. The spacious kitchen with center island and breakfast area is the heart of the home. The family room, with custom built-ins and French doors, leads out to the beautifully landscaped backyard. The adjacent library with stately fireplace is one of the many highlights of this home.